Why do “maladies of the soul” such as hysteria, anxiety disorders, or depression wax and wane over time? 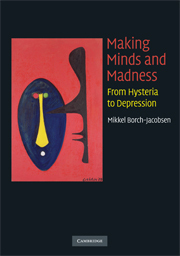 Through a study of the history of psychiatry, Mikkel Borch-Jacobsen provocatively argues that most mental illnesses are not, in fact, diseases but the product of varying expectations shared and negotiated by therapists and patients. With a series of fascinating historical vignettes, stretching from Freud’s creation of false memories of sexual abuse in his early hysterical patients to today’s promotion and marketing of depression by drug companies, Making Minds and Madness offers a powerful critique of all the theories, such as psychoanalysis and biomedical psychiatry, that claim to discover facts about the human psyche while, in reality, producing them. Borch-Jacobsen proposes such objectivizing approaches should be abandoned in favor of a constructionist and relativist psychology that recognizes the artifactual and interactive character of psychic productions instead of attempting to deny or control it. Mikkel Borch-Jacobsen is Professor of French and Comparative Literature at the University of Washington. He is the author of highly influential books on the theory and history of psychiatry and psychoanalysis, and co-author of the best-selling Le livre noir de la psychanalyse (The Black Book of Psychoanalysis). 4 What made Albert run? 7 Is psychoanalysis a fairy-tale? Much of the material in this book was previously incorporated into papers that have appeared in a variety of periodicals and collections since the mid-1990s. I thank my earlier publishers for permission to use these texts. But several of this book’s chapters are new in English, and one consists entirely of material published here for the first time. The chapters containing previously published material reflect revisions, augmentations, and abridgments undertaken to avoid repetition and streamline the book’s argument. Although these chapters were originally written as separate essays, weaving them together has not proved too artificial a task. They all address, from various angles, the same basic issues: the historicity of “mental illnesses,” the co-production of psychic “facts” (what I call “artifacts”), and the performative character of our psychological and psychiatric theories. The introduction began as a paper presented at the conference “History of psychiatry. New approaches, new perspectives,” held in Lausanne in 1997, and it appeared under a slightly different title in History of the Human Sciences, vol. 14, no. 2. It offers a “discourse on method” of sorts, mapping out the general argument of the book. Crews, Han Israëls, and Allen Esterson (Freud advocates did not raise any objections). Chapter 3 was published in French in my book Folies à plusieurs (2002) and was adapted from a seminar given in December 2000 at the Ecole des Hautes Etudes en Sciences Sociales; it also takes up elements from a previous essay on multiple personality (1994c). The sections on Shirley Mason’s biography are based on research done in 1998–99, in collaboration with Peter J. Swales, who accomplished in the process a truly amazing work of archival gathering and historical reconstruction to which I am heavily indebted. Swales and I have both presented our research in various venues (Boynton 1998–99; Croes 1999; Borch-Jacobsen 1999b; Swales 2000). I want to thank here all those who agreed to share their memories and/or personal archives with us: Virginia Flores Cravens and Graciela (“Mikki”) Flores Watson; Harold, Cleo, and David Eichman; Dr. Herbert Spiegel; Dr. Dan Houlihan; and Dr. Mildred Bateman. Thanks also to my colleague Jennifer Bean for tracking down an obscure documentary film on narcosynthesis produced by Shirley Mason’s therapist, Cornelia B. Wilbur. Part II, also containing three chapters, focuses on what I see as the core of my argument, the co-production of psychological artifacts: people react in complex ways to ideas and to expectations about them, so that psychological and psychiatric theories inevitably influence and mold the “psychical reality” they claim to describe. Chapter 4, which first appeared in the London Review of Books, May 27, 1999, pays homage to Ian Hacking’s kindred work on “interactive kinds” and “transient mental illnesses,” Chapters 5 and 6 trace this idea of a co-construction of reality back to late nineteenth-century discussions about hypnosis and suggestion, and most notably to the wonderful work of the mathematician, philosopher, and hypnotist Joseph Delbœuf. Chapter 5 appeared first in French, in 1997, in a special issue of the journal Corpus, 32, edited by Jacqueline Carroy and Pierre-Henri Castel and devoted to Hippolyte Bernheim and Joseph Delbœuf, and then in English, in Qui Parle?, 16, no. 1. Chapter 6 was originally a paper presented at a conference held in Paris in March 2002, which centered on the work of my late friend Léon Chertok, MD (1911–91), an ardent advocate of hypnosis and hypnotherapy in a country, Freudian France, that at the time was utterly averse to it; John Forrester, a Freudian, gamely published the paper in English in Psychoanalysis and History, 7, no. 1.
here. Chapter 8, originally a paper published in History of the Human Sciences, 21, no. 1 (2008), coins a new word, “interprefaction,” to refer to the way in which Freud created facts with words, all the while denying that he was doing this. The paper was written in collaboration with Sonu Shamdasani and introduces an argument developed in our book on Freud (2006). Sonu has been an important interlocutor over the years, and I cannot begin to measure how much my own work owes to our collaboration. Chapter 9 is downright mean: it calls out psychoanalysis as a “zero theory” that has proliferated precisely because it is utterly devoid of stable content. Under a different title, the chapter was published as an essay in the London Review of Books, May 24, 2001; as a letter to the editor noted at the time, it elicited no rebuttals from psychoanalysts. After psychoanalysis, Prozac® and Ritalin®: Part IV deals with the rise of biological psychiatry and its consequences. Chapter 10, originally published by Marcel Gauchet in Le Débat, 114, sets the stage for the discussion that follows. Chapter 11 appeared under a different title in the London Review of Books, July 11, 2002. It uses the example of depression to argue that biological psychiatry, no less than psychotherapy and psychodynamic psychiatry, also “makes minds and madness”: our fin-de-siècle “depression,” I claim with David Healy and Philippe Pignarre, is in large part a historical side effect of antidepressants. Chapter 12 is adapted from my contribution to a very exciting seminar, “Psychology, ideology and philosophy,” held in Brussels in June 2006 under the auspices of the Université Libre de Bruxelles and subsequently aired on Radio France Culture. It reflects on the present situation of psychotherapy in the era of randomized, double-blind, placebo-controlled trials and mass production of new “mental illnesses.” Chapter 13 takes up this discussion about the phenomenon of “disease mongering” and ends with some uncomfortable questions about the role of patients in the creation of their own illnesses. The chapter originated in a lecture given in October 2006 at a conference organized in Paris by the Centre Georges Devereux around the theme “Psychotherapy put to the test by its users” (La psychothérapie à l’épreuve de ses usagers). Members of several French patient-advocacy groups were present in the audience and on the podium; to my relief, most of them reacted positively to my remarks. The lecture was subsequently published in Le Débat, 152 (November–December 2008). With one exception – the postscript to Chapter 2, originally published in Danish – all the chapters in this book have been translated or adapted from French, which remains my langue de plume. Douglas Brick translated the Introduction and Chapters 1, 2, 5, and 7. Jennifer Church translated Chapters 4, 8, 9, 10, and 11. Grant Mandarino translated Chapter 3. Kelly Walsh’s translation of Chapters 12 and 13 was made possible by a grant from the Graduate School of the University of Washington, which is gratefully acknowledged. Lisa Appignanesi and John Forrester kindly offered to translate Chapter 6 at a moment when I could not do it myself. I thank them all for their contributions. I should add that I worked closely with them on the translations and often decided to rewrite passages to make them less Gallic. Sonu Shamdasani further emended our Chapter 8. Frances Brown, who ably edited the manuscript of this book for the publisher, added yet another layer of stylistic varnish. Therefore, any resemblance to the French originals is most likely to be coincidental. In addition to those already mentioned, many other people contributed their help, advice, or friendly critiques to this book: Stéphane Barbéry, Odette Chertok, Frederick Crews, Todd Dufresne, Allen Esterson, Ernst Falzeder, Henri Grivois, Ian Hacking, Han Israëls, Michael G. Kenny, André LeBlanc, Patrick Mahony, Eric Michaud, Tobie Nathan, Michael Neve, Philippe Pignarre, Paul Roazen, François Roustang, Anthony Stadlen, and Isabelle Stengers. Warm thanks to all.